LARRY KUDLOW: All right, Sunday marks the 10th anniversary since the horrible and tragic September 11 terrorist attacks that murdered more than 3,000 innocent victims. And tonight, New York City and Washington D.C. on alert once again. New details are emerging about what U.S. officials are calling a credible, but unconfirmed Al-Qaida terrorist bomb threat. 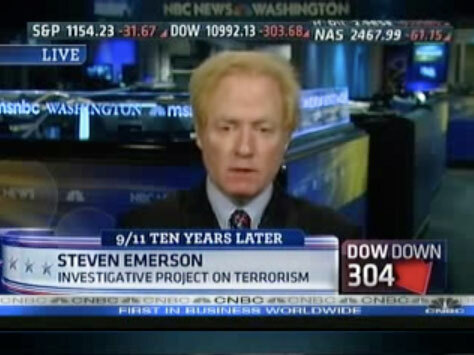 Terrorism expert, Steve Emerson, joins us now with fresh info from his own government sources. Steve, welcome back. What is the latest on this? Can the threat be confirmed? STEVE EMERSON: No, the threat can't be confirmed, but the threat came from, quote, a "single source" or a "single stream." And as you know, the U.S. picks up many streams every day of intelligence. 99% of it turns out to be false, disinformation, or incorrectly translated, whatever. This piece of information that was picked up about 60 hours ago was very, very specific about plans to have an attack in New York City. Very specific. And that is what galvanized American officials. Also, because it was a new source of information that had not been tested before [there was little reason to doubt its authenticity]. KUDLOW: And, and Steve, let me just--I don't mean to interrupt. But, I just want to pursue this. The specificity of this is what got everybody's attention. Description of the people, I guess two people, or at least one person, and tactics, targets, and timing, and description. Now, is that specific information still on the table? EMERSON: No, I don't believe that it was that specific, [or] that they actually had the timing or the actual target itself. They mentioned possible targets, that is the stream of intelligence. It alluded to a possible suicide truck bombing. It mentioned a couple of other alternatives, in terms of carrying out some bombing in New York City. That's what got people concerned. And, number two, I just learned that it was not Al-Qaida related. Everybody has been saying all day in the media that it was Al-Qaida. But, it turned out to be not Al-Qaida related. The question is whether it's a new group or just a bunch of wannabes. Two American citizens, naturalized American citizens, are involved. They have not been identified yet. And, a third person, in Pakistan has been cited, but he also has not been found. KUDLOW: Alright, we are going to leave it there. Very interesting stuff. We will see how it turns out. Many, many thanks to our friend Steve Emerson.